Though there are also some other Pay Scale Systems in Pakistan except Basic Pay Scale Structure (BPS) but BPS is widely used pay scale system in Pakistan. Most of the Government Departments and Organizations follow BPS System. SPS and army scales are examples of other pay systems in Pakistan while private organizations/companies/industries are free to make their own pay structures while Government fixes a minimum salary of any private employee. BPS scales are regularly revised after every few years. Previously these were revised in 2008 and now after three years these are once again revised in 2011 keeping in view the inflation rate in Pakistan. Here I am giving BPS pay structure in brief. Note: Minimum Pay, Maximum Pay, Annual Increments and all other allowances etc are in Pak Rupees. Civil servants are also entitled various other allowances (as per their department/organization rules and their service terms) along with their basic pay, as a part of their Gross Pay. These allowances may include Ad hoc Relief Allowance, Medical Allowance, Special Pay, Conveyance Allowance, House Rent allowance and several other miscellaneous allowances, which are applicable. Government also pays pensions to its retired employees. Federal Government and provincial governments have their separate pay systems closely similar to each other. Government of Pakistan has announced an adhoc relief allowance of 20 percent of the running basic pay to all the employees of federal pay for the year 2012 ~ 2013. Provincial governments also announced the same for their employees. There is no transparency in the pay structures which are subverted by perks and allowances. How do you compare the actual salary and benefits of a college professor and say a DPO/DCO both on BPS 19? One lives in poverty while the other has several new vehicles, lots of servants, an expensive house, medical care and so on and so forth? And why is the Army pay structure such a secret, even their website makes no reference to salaries or benefits? Is a full Colonel grade 19? How does a Colonels health benefit, education for children, pension, pay, housing, fuel allowance package compare with a Civil Judge or a secondary school Headmaster? Colonel is now no more a grade 19 officer but has recently upgraded to grade 20. Similarly for higher ranks. But pakistan telecommunication company is still exempted from revised pay scale in 2011.
what are stages here in this table? These salaries are not compatible with the increasing cost of Living.The stages are years, hence stgaes=20 means Years=20. A Major in the Army at BPS 18 makes PKR 22000/month. The cost of gasolene(petrol) on 02/22/2013 was PKR 127/Litre; 127 x4.0= PKR 508/Gallon. A regular size car goes 40 miles to a gallon, and a 10 gallon tank. Therefore, 508 x 10 = 5080. 5080 is 1/4 of 22000. Therefore a Major can only live on 10 gallons of petrol per month, and use the other 3/4 of his salary on food & shelter. Therefore, these salaries are not competitive with the Cost of Living. how u can say that in 2003 gold is 550 per gm, it was not even 5 thousand at that time, plz check statistics of gold then comment. we got a proposal for our sister from a captain in Pak army. How can we verify that whether he is really employed in army on that rank or not. because we don't have any relative in Pak army who can check it. What is the pay of F3 scale? 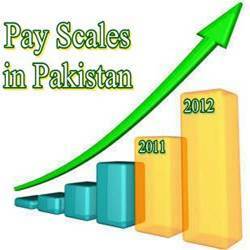 ptcl is earning profit, not giving and revised pay scale. Please tell me about the salary of BPS-16 Coordination Officer in Pakistan established Pakistan Industrial Technical Assistance Centre (PITAC) Lahore which is under the administrative control of Ministry of Industries, Government of Pakistan. What's the BPS 17 salary at IESCO? ?